A basic pose in karate that conveys strength. Karate is a martial art that originated in China. It developed in mainland Japan after being transmitted to Okinawa and other nearby islands. Karate uses no weapons but instead relies on three basic movements of the hands and feet: thrusts, kicks, and arm strikes. In addition to being a competitive sport, it is also an effective means of self-defense. 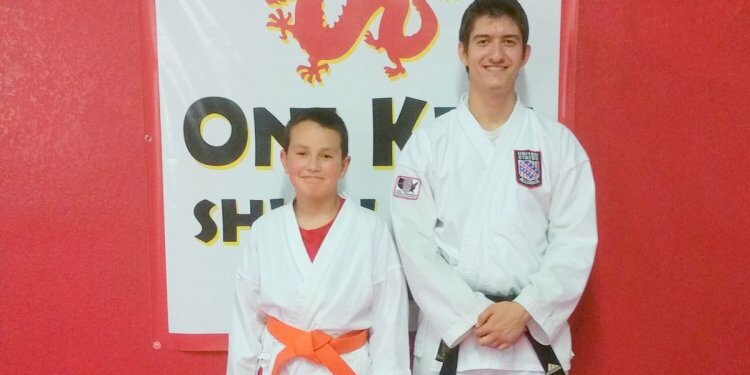 Karate is not just for adults, with many kids learning the sport. Depending on the level of skill, different colored belts are worn, with those who have reached higher ranks wearing black belts. There are many schools of karate, and contest rules concerning protective equipment and the degree of physical contact that is permitted differ according to school. Karate matches are full of excitement and tension. Originally karate was practiced in secrecy. It was only toward the end of the Meiji era (1868-1912) that the public was allowed to practice it. From then on it gradually grew in popularity. The Japan Karate-do Federation, which is active in promoting the sport overseas, was established in 1964.